This week of fishing has been as good a week as you could ask for. Monday started out with a fly rod first thing catching some real nice trout on the fly, then taking out the spinning rod. 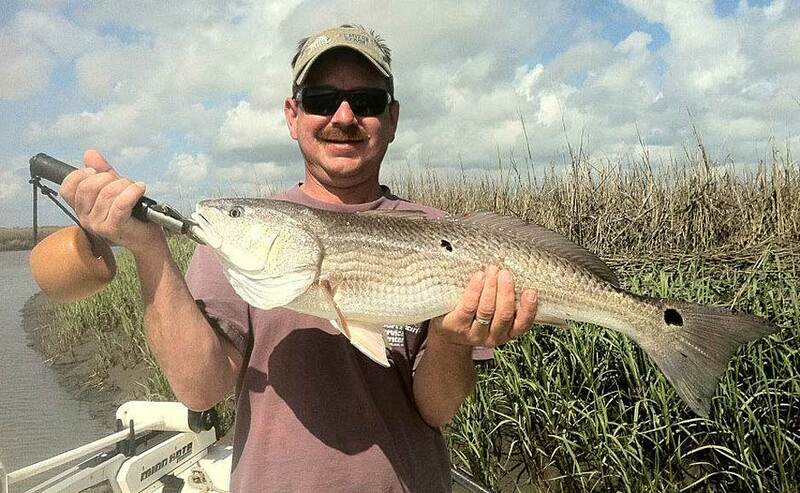 For about three hours we stayed hooked up on upper slot redfish 24” – 26”, and over slot fish 27” – 32”. Then we finished the 6 hour trip at the inlet and back on the fly rod catching Jack Crevelle up to 5 lbs. The rest of the week was all redfish – big numbers of slot fish and again averaging 2 – 3 over slot fish in the 28” – 32” range. The only day we didn’t catch the big numbers was Thursday’s half day trip, where about the time the tide was getting right we got run off the water by thunderstorms. We ended up with three slot redfish 18” – 27”, one over slot 28” fish, and one flounder about 3 lbs. Our water has recovered from the large amount of rain we had in the first part of May and the redfish have returned to the backcountry creeks that they like to live in. Fishing the back country has been pretty predictable and productive. It has been so productive that I haven’t fished the Intracoastal waterway in a couple of weeks. 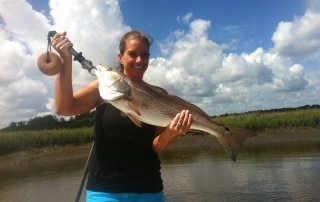 We have been catching good numbers of redfish in the keeper size slot between 18” – 27” and averaging 2 – 3 fish a day over slot between 28” and 32”. The first week of May brought ten plus inches of rain to the area. That much rain in a short amount of time turned the water fresh and muddy. The farther from the inlet you went the worse the quality of water you had. We had to adapt to the conditions by staying out of the backcountry and fishing areas on the intracoastal and close to the inlet. These areas produced plenty of redfish, trout, & black drum but you had to stay on your toes and keep moving because the fish were either moving around a lot or biting one day and not the next. 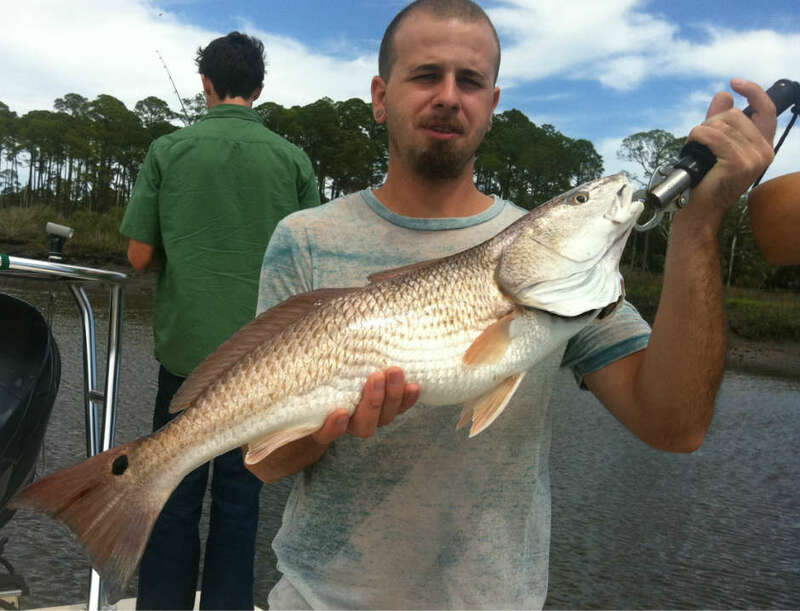 By the third week of the month the water started getting back to normal and the red fish started moving back into areas of the backcountry were we normally fish for them. As of today June 3rd the fishing is on fire. Today we fished a half-day trip and did not keep count but I would guess we had at least a dozen black drum in the 2lb to 3lb range and probably 20 red fish between 20in and 32in long. It was a week of great fishing. The weather was in the mid 70s with sun every day. This was probably one of the best weeks of weather we’ve had in awhile in the Northeast Florida area. As the water warms, our large school of fish on the flats are separating and getting smaller every day. We’ve been targeting most of the fish in the last couple of weeks in surrounding backcountry creeks. Jerry Ivans and I fished 4 days this week. 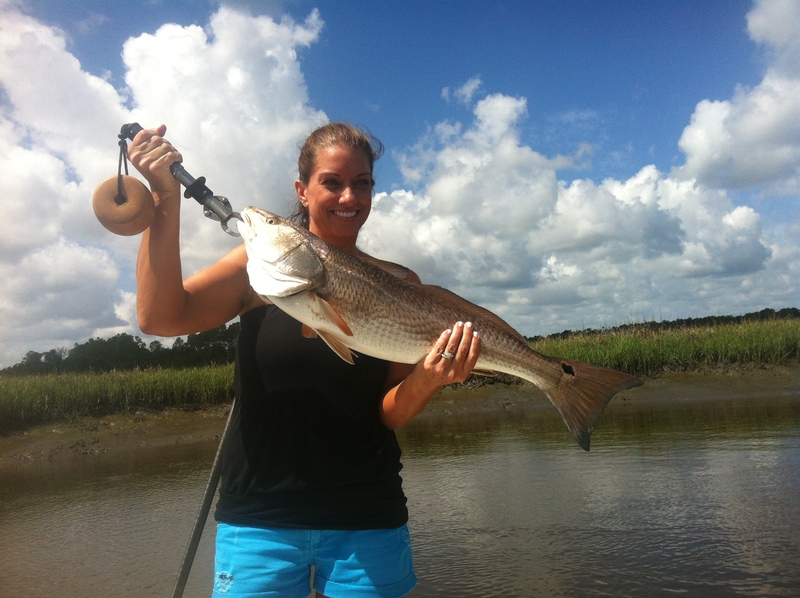 We caught a big number of redfish every day. Jerry is from Joplin, Missouri and had never experienced salt water fishing. He was amazed by the tide swings we had in this St. Augustine, Florida area. On Friday, April 26 and 27, I fished with Bob Lachance from Quebec. He brought his girlfriend down to Florida to enjoy our great weather and fishing. This was a half day fishing trip. At the 3 and half hour mark, Bob had caught so many fish and he was ready to call it a day. The catch included numerous redfish, one trout that weighed 8 and a half pounds. Bob was very happy and will be back soon. This was a fantastic week of fishing. Fished all five days with plenty of redfish caught. 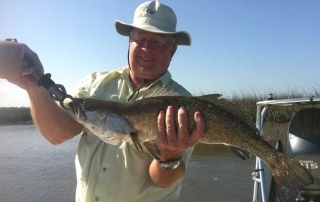 The speckled trout bite was spotty with a few mixed in the catch each day. As with the black drum. 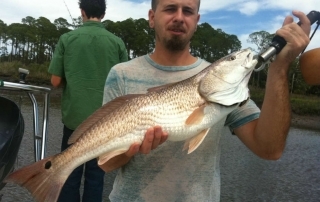 A lot of the red fish this week were oversized between 27 to 33 inches. 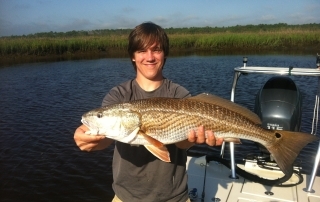 Here are the photos from this week’s fishing charters. 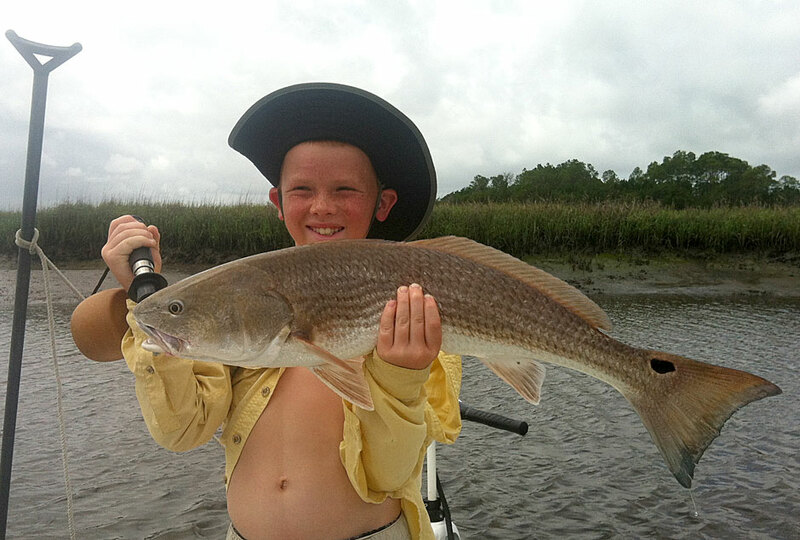 Every day this week we caught big numbers of redfish. With probably half the fish we caught being oversized – 27 to 33 inches. 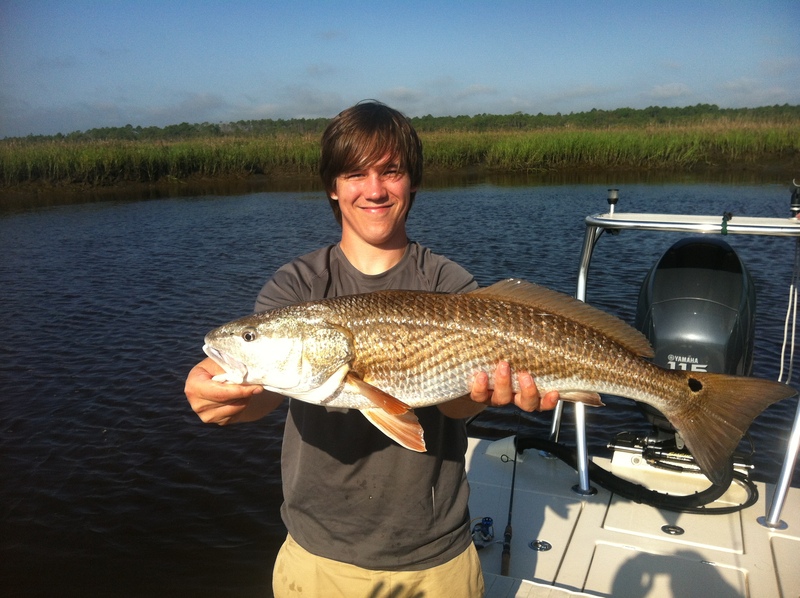 Here are more photos from this week’s fishing charters.